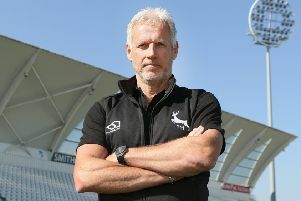 There was huge frustration and disappointment at Trent Bridge where heavy rain caused the abandonment of the NatWest T20 Blast match between Notts Outlaws and Derbyshire Falcons last night. The weather had deteriorated long before the scheduled 7.15pm start and umpires Peter Hartley and Neil Mallender had little option but to call off the keenly-anticipated local derby around one hour later. With no play possible, the large crowd were denied the opportunity of seeing Andre Russell make his Notts debut. The West Indian all-rounder has joined the county on a short-term contract and will be available for just four matches, although the remainder will all be played away from Trent Bridge. The abandonment leaves the local rivals with a point apiece, taking Derbyshire on to five points and Notts to three, each having now completed four matches in the North Group.